How is the EU communicating in the Age of Digital Disruption? Case Study of the ‘End of Roaming’ - Harold Tor. In the aftermath of Brexit and the rise of anti-EU movements across Europe, the European Union is often portrayed as an undemocratic body that legislates in isolation, far removed from the daily reality faced by European citizens. This begs the question whether the EU is communicating effectively with citizens, because this communications process is an indispensable element of the modern European political system, and is crucial in instilling a sense of participation among the citizenry in the decision-making process. In the Age of Digital Disruption, digital media provides both an opportunity and a threat to how the state interacts with the population. Taking the data collected during the launch of The End of Roaming on 22 June 2017, Harold Tor analyses the state of play of the information-sharing and interactions between different EU-level actors, member states, the media and citizens – a matter that lies at the very heart of the existential crisis faced by the supranational body today. In the aftermath of Brexit and the rise of anti-EU movements across Europe, the EU is often portrayed as an undemocratic body that legislates in isolation, far removed from the daily reality faced by European citizens. This negative perception begs the question whether the EU authorities really care about European citizens. If it does, how is the information about its work passed on to citizens, in the very same way information about the national state and its decisions is being shared with and discussed by citizens. This communications process lies at the very heart of the modern European political system, and is crucial in instilling a sense of participation among the citizenry in the decision-making process. Without it, citizens are unable to exercise their democratic rights by basing their electoral decision on the information they previously received. With the rise of digital platforms, communications processes have been radically transformed, and this too has influenced the behaviour and expectations of different political actors. Until now, the information process had always been downward-vertical from state actors, processed through the media, before reaching the citizens. The use of social media data and advertising, to target and change the opinions of any given segment of the population on specific policy issues, especially in the context of an election. These key elements of the Digital Disruption have happened in every modern society, and is certainly taking place in the larger context of the European Union. Based on the data collected about the End of Mobile Roaming on 15 June 2017, this special report aims to get a clearer picture of the communications processes around this piece of legislation, so as to help answer the questions we have laid out above. The report is divided into two parts: In the first part, we will look at the results of the data collected from all available digital platforms about the End of Roaming from 12 to 15 June 2017. 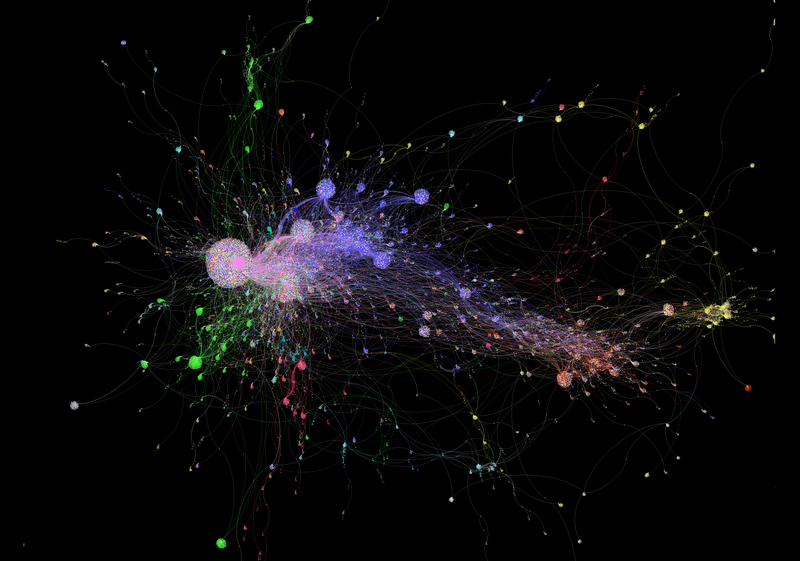 In the second part, we will focus on the network visualisation of the Twitter conversations in the same period. Why the ‘End of Roaming’? I have chosen this topic because it is a popular, consumer-friendly subject-matter. Any communications around it will thus be easily understood by all segments of the society. Should there be a topic that would reverberate across Europe, this would be it, compared with a more difficult topic like the Emissions Trading System. Furthermore, the state actors in the European institutions consider this as a very symbolic piece of legislation that embodies the Pillar of the Freedom of Movement enshrined in the Treaty of Maastricht. For them, the End of Roaming is the Virtual Schengen. Hence the EU has even more reasons to communicate about this. Below are the results of data collected across all platforms. A total of 77,792 data points were collected over four days, from 12 June to 15 June which covered most social media platforms, websites and media types. Communications originating from the European Commission began on the Monday but intensified only on the day of the launch itself. Twitter emerges as the major platform when it comes to communicating about this EU legislation, with the main bulk of the 69% taking place there. The second platform is News websites, at 12.6%. This points to the continued role of the media as the intermediary between the state and the population. The third place goes to blogs, at 5.67%, and it points to the increasing use of online self-publication. Facebook only accounts for 5.5% of the data collected. The low count could be due to the fact that only public pages can be crawled, not private profiles. More than half (55.87%) of the posts are in English. German occupies the second place at 12.53%, followed by Italian (7.92%) and Spanish (7.88%). This could point to two things: English is the lingua franca in all things concerning the EU, or English speakers are voracious discussants of EU matters. All the other language fall significantly behind. It is difficult to accurately collate location data for social media posts. Should we ignore ‘Other’ and ‘Unknown’, the highest number of posts seems to have come from the United Kingdom, followed by the United States. It would likely explain the large number of English-language content, and is somewhow ironic that a major piece of legislation is being discussed by a country that is outside the EU, and the other that is going out of the EU. These are the major keywords identified in the data collected. While the obvious words are roaming and charges and related words in English, keywords in other languages show there were active communications taking place in other languages. Countries marked with an asterisk* indicate that the number of posts is negligible, and we can see that the keywords are consistently only in English. This could be an indication that users from those countries are conversing not among themselves but with other users from other countries. A possible scenario is these are people working for or in the European institutions, and they are not communicating with networks at the national level. The data for Belgium shows that the main keywords are only in English, pointing to the large number of posts coming from the users there who mostly are situated in the so-called Brussels Bubble. We shall be able to test this assumption by juxtaposing the language and geographical data of Twitter in the second part of this report. Secondly, if we ignore the countries with asterisk, the incidences of the use of the keyword EU are likewise lower, and often replaced by the word for ‘Europe’ in the national language. Furthermore, the number of usage of the word ‘Commission’ – referring to the European Commission which announced the news – is six. This points to a general lack of understanding of the institutions that form the European Union’s decision-making structure. English is undeniably the most important language used in the communications about the End of Roaming, based on the quantity of posts written in that language. If we were to assume that its major role is due to the need to communicate outside of one’s national community, then there is a possibility that the communications is done between the institutions and the multi-national workforce supporting them. A second scenario is that English speakers are extremely interested in this piece of legislation such that they form the largest chunk of conversations on the End of Roaming. In either case, it would point to a gap in the communications between the EU and the bulk of the different national communities in the member states. It is also noteworthy to point out the interest that UK users are showing in the End of Roaming, which directly correlates with our observation of the prominence of English in our data. It could be linked to the ongoing Brexit negotiations and that this could be a benefit they would lose if it were not to be included in the negotiations. For our purpose, it would be of use to find out whether the conversations were conducted by UK citizens themselves, if so whether they were conversations that included the institutions, or whether it involved the media or national policymakers. It is indisputable that Twitter is the major social media platform where many of the conversations take place, whether those conversations have the most direct impact in shaping citizens’ perception of the EU is another matter altogether. Like all social media data analyses, we need to caution against the degree of representation of the data due to the so-called digital divide. Digital divide is not only between those who know how to use digital platforms and those who do not. It is also a divide between those who can afford it and those who cannot. It is also a question of privacy, cultural expression, self-censorship and motive. Once we accept that social media data only pertains to a segment of the population, we can then safely accept that its conclusions are only indicative. For the purpose of this analysis, it is good that Twitter is the most used platform as it will offer us a greater possibility in delving into the specifics of the conversations and the networks conducting those conversations. The second part of the report below will focus on a mapping of the Twitter conversations, in an attempt to shed more light onto some of the issues touched on above. What is the digital communications landscape on a particular piece of legislation like on Twitter? Are the EU institutions in direct conversation with citizens? If not, who are the intermediaries of those conversations? Are they policymakers at the European level? Are they national politicians and institutions? What is the role of the media outlets and journalists? From the 77,792 data points gathered, I have identified 53,949 Twitter posts. Because we are looking specifically at conversations – meaning ‘retweets’, ‘likes’ and ‘replies’ on Twitter – and not stand-alone comments, I managed to isolate 40,409 Twitter conversations. 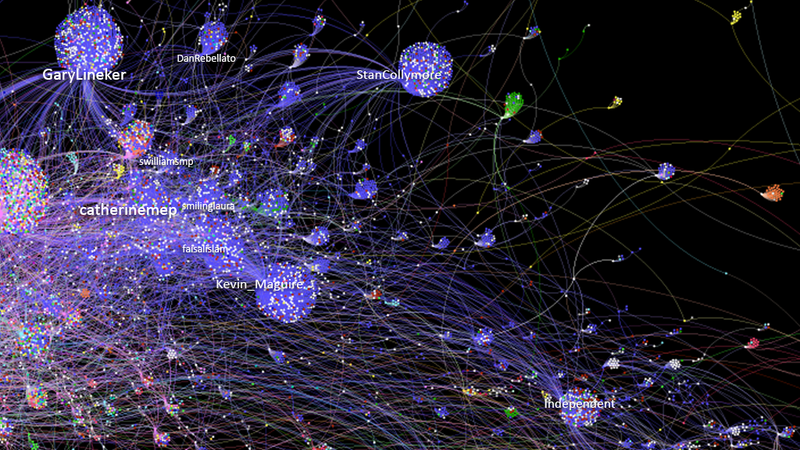 It is from this basis that I have started the process of network visualisation. A total of 32,426 users were identified. Each user forms a ‘node’ and each interaction between two nodes is represented by a line called ‘edge’. In the original results, there were thousands of small-scale conversations of not more than 10 users. Those were hidden in order to not cloud the data of the larger conversation communities, hence only 89% of the conversations are now visible. What we do need to bear in mind is the existence of these private conversations, most likely among citizens, who are discussing the End of Roaming without any reference to any media outlets, journalists or state actors. Another point to highlight is the size of the nodes. 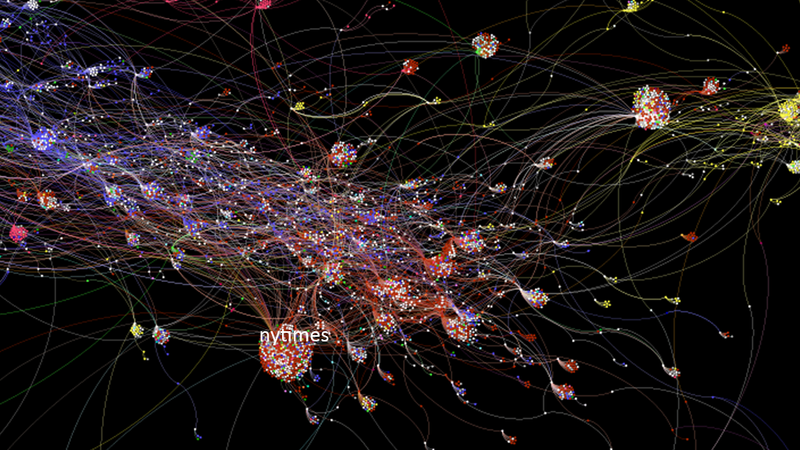 The more conversations a user has with his or her network, the bigger the node is. I have chosen to ignore the number of posts a user sends out, because it is the reactions from the person’s community that I am interested in. Likewise, the number of followers does not feature. A user may have large number of users, but may not be the influencer he or she seems to be, because the individual is not able to obtain sufficient interest from his or her followers. Some manual removal of accounts and data were also necessary, as is the case for most trending topics, the data was clouded by spam users and conversations. It was a tedious undertaking so only the most obvious were removed. I also did not take into account the opinions expressed in the 40,409 posts. Sentiment measurements are often inaccurate, and it is also not the point of this exercise, which is to look at the communication networks that are formed around a piece of legislation, whether they are positive or negative. This visualisation shows the major conversation networks with the country location of each user marked in different colours. As you can see, most of the conversations were very spread out and unrelated, except for the purple and blue groups. I will explain the largest conversation groups in further detail below. 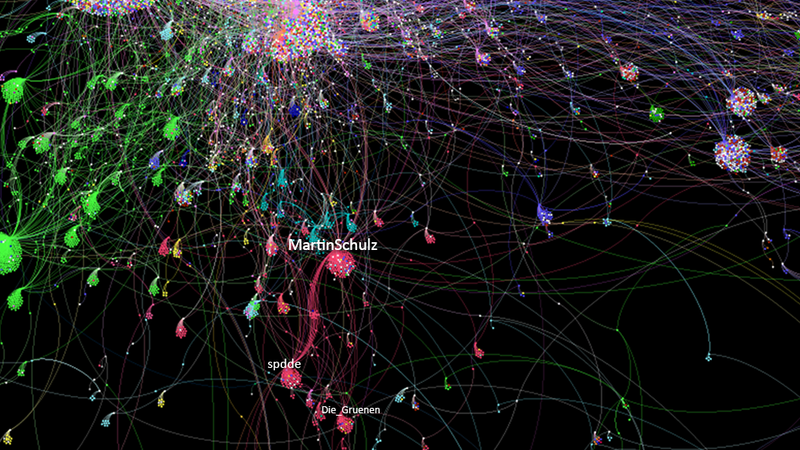 In the middle, you can see the conversations in purple, which represents Belgium. This is the location with the largest conversation networks that are closely linked to one another. 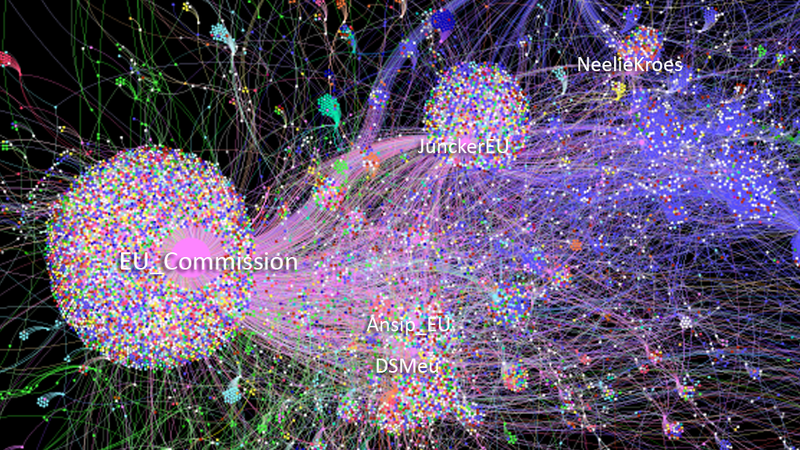 The biggest network is that of European Commission, which is surrounded by a huge group of multi-coloured nodes. This is a consistent feature of the other significant users in this group, such as those of @Ansip_EU, @DSMeu and @JunckerEU. If we delve deeper into the multi-coloured accounts here, we will see that these are users which are either EU-level policymakers or persons who are somehow related to the European institutions. The multi-coloured nodes shows the different locations of users which are communicating with these accounts. This shows that the communication networks stretch across different countries. This could either mean these accounts are communicating with EU citizens across Europe, OR they are communicating with people who are from across Europe but are not ordinary citizens and are somehow tied to the European institutions. My hunch is the latter scenario, because the multi-coloured networks are communicating among themselves, and do not lead on to national networks to other colours, except for the UK. The networks in blue are those based in the UK. It is the only communications group that seems to grow out of the Belgium group. Closest to the Belgium side is the Member of European Parliament Catherine Bearder @catherinemep. The other politician in this group is Stephen Williams @swilliamsmp (LibDem). It is notable that in the UK network, there were sizeable intensive conversations led by individual journalists: @Kevin_Maguire an associate editor at the Daily Mirror, @faisalislam is the political editor of Sky News and @GaryLineker is sports broadcaster at the BBC. There were also well-known figures leading large conversation networks, a bit further away from the main conversations: @StanCollymore is a former football player and @DanRebellato is a playwright. Further down in the Blue group, you have the media outlet The @Independent. It is in between the UK and the US group, most likely due to its readership from both sides of the pond. To the south of the Blue Group in red are conversations in the US marked in Orange. Here, the biggest conversation is led by New York Times @nytimes, the rest are led by private citizens. The Yellow Group represents the networks in Spain. 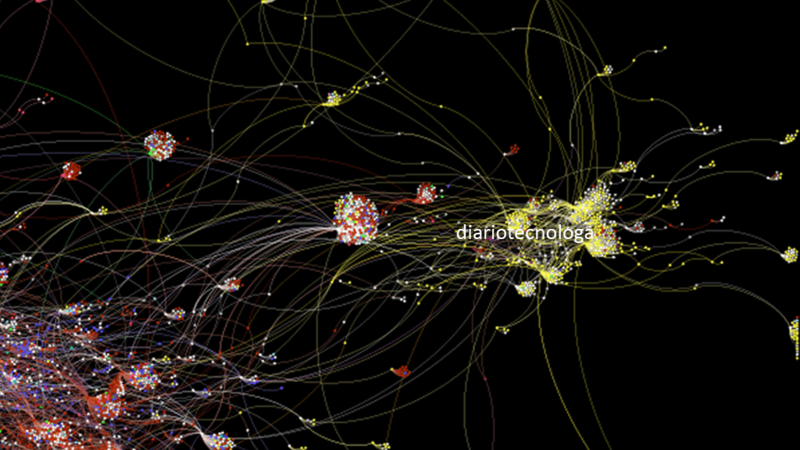 A notable conversation group is that of @DiarioTecnologa, a technology blog in Spain. Otherwise it is not at all linked to the EU institutional networks. The bright green group represents conversations in Italy and they seem close to but not quite linked to the institutional networks in Belgium, unlike the UK conversations. Two accounts stand out: The largest network is led by former Prime Minister Matteo Renzi, who despite his tree million followers, led a comparatively smaller conversation here. Further to the north, is former Prime Minister Enrico Letta. Below the Belgium group, the Red Group represents communities in Germany. It is located closer to the Belgium group but not entirely linked. Closest to the institutional networks is Martin Schulz @MartinSchulz, former President of the European Parliament and current leader of the Social Democratic Party. His party @spdde and the Greens @Die_Gruenen are the only political parties that were visibly leading a conversation on the issue, not only in Germany but throughout Europe. This visualisation looks specifically at the languages used in the conversations. The big purple region proves that most of the conversations conducted in Belgium, the UK and the US were conducted in English. 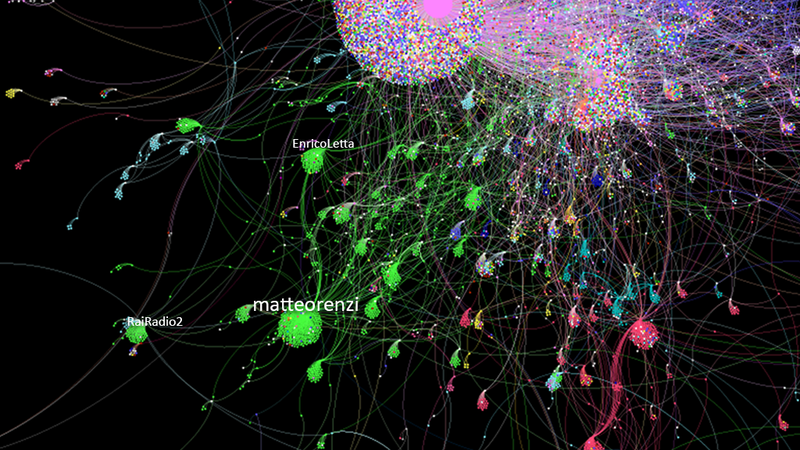 Not surprisingly, the conversations in Germany (red), Spain (yellow) and Italy (green) were done in their own language. The only group that commands a multi-lingual conversation is that of @EU_Commission. In the other map, we have identified the possibility that these big communities located in Belgium may just be actors closely linked to the EU communicating among themselves. On this map, we can see a difference between the @EU_Commission and the other Belgium accounts like @JunckerEU ad @DSMeu. For the other Belgium accounts, the conversations are conducted mostly in English, indicating English is being used to communicate among people of different origins. This is not the case with @EU_Commission. However, as noticed earlier, these multi-lingual and multi-national conversations do not extend beyond its own network, this shows that it is a closed community that is not linked to any other communities at the national level. We can draw a number of conclusions from this exercise, which attempts to answer some of the questions we set out in the first place. First of all, is the European Union and its state actors communicating directly with EU citizens? The data says no, because the core conversation communities formed around the example topic of the End of Roaming is restricted to Belgium – most likely within the so-called Brussels Bubble. EU policymakers such as Commission President Jean-Claude Juncker and Vice-President Andrus Ansip continue to speak with their EU-related communities. The only account that is reaching beyond the group is that of the European Commission. However, this network stops short of further connecting with national networks. Secondly, the only notable network discussing the issue is that of the United Kingdom. This network extends from the EU-related group, showing that these are people related to the European Union, yet are mediating between the EU and UK citizens. MEP Catherine Bearder is also the only EU-level policymaker making the link between an EU-level policy area with the national community. One might suggest the prominence of the UK to be linked to Brexit. It is however not the purpose of this exercise to determine the link between the issue of roaming, the opinions of UK citizens and Brexit. What is noteworthy is the rising role of individual influencers in this case study. Journalists, not media organisations, are key lead figures leading the large-scale conversations. This is consistent with the theory of digital disruption we are experiencing in recent years, where individual journalists who are skilled at using digital media command powerful influence over their readership. Likewise, well-known individuals like sports personalities are as powerful as journalists in starting and maintaining a conversation online. To a large extent, this phenomenon is unprecedented in the pre-digital age and this represents a huge departure from how people engage in political issues in a more traditional setting. That being said, news outlets such as The Independent and New York Times still have a noticeable if not major gathering. Their communities are certainly more multi-national than those of the individuals, which goes to show traditional news outlets are not as integrated in a local community because of the neutrality they have to assume and the more formal stance in their engagements compared to individual journalists. The disparate nature of the conversations has already been touched on above. This paints a disjointed picture of how different national communities are having their side conversations on an EU-initiated decision. What is significant about our findings is there were very few national state actors involved in the conversations. No government accounts have been detected. Only two national-level political parties from Germany talked about the issue. This goes to show the current state of affairs regarding the EU and EU citizens: the lack of an intermediary between European-level actors and the citizens on the ground. Very few national-level politicians led conversations about this European policy decision. It is also remarkable that all other EU member states are remarkably absent from the map, especially France, considering the End of Roaming marks a historical milestone in the history of the European Union. My last observation concerns the prevalence of English. English is clearly the lingua franca of the EU institutions and its actors. The advantage of English is that it is a single administrative language that everyone can rely on. English is a likely reason why UK-based communication networks were more closely linked to the EU-related networks, apart from the leadership shown by an MEP and several journalists. But it is not all the fault of English alone: No intermediaries in any other EU country that were as extensive as the case of the UK where MEPs, national-level politicians and parties, journalists, bloggers or celebrities, bridge the gap between Brussels and its citizens. In the Age of Digital Disruption, it is clear that we are in the midst of transiting from a top-down vertical system of three estates to a multi-stakeholder system where the individual – whether they are state actors, journalists or influential blogger – play the role as anchors of a political debate. In this context, the EU, being a supranational state organ, faces a communications dilemma, where it has to deal with a radical change in the way representative democracy is being conducted both online and offline, and the uncomfortable position since its inception of having to rely on national-level state and media entities to engage effectively with citizens. Please feel free to leave a comment below, should you have any questions for me.